The Lite-Brite Leech is an excellent version of a Woolly Bugger style fly that takes most warmwater gamefish, especially stream smallmouth. My friend Mike Jacobs ties a great leech imitation that takes lots of Bass, Bluegills, Crappies, Catfish, Carp and other gamefish for him throughout the season. I have first hand knowledge of the little streamer's effectiveness. On several outings on Northeast Iowa Smallmouth Streams I have observed Mike using his little Leech to the exclusion of other flies and end up with a 50-plus fish day. But, I have a problem with Mike's Leech. I can't tie it because he uses a dubbing brush comprised of fur and pieces of Lite-Brite dubbing that are twisted together on a very thin strand of copper wire. That process requires a special device and unfortunately that device is no longer on the market. However, with the help of a coffee grinder that I use for blending fur, I think I have solved my delimma. I blend Peacock Herl Lite-Brite Dubbing with rabbit fur and end up with a dubbing blend that approximates the blend on Mike's dubbing brushes. The blend that I ended up with is approximately a 50-50 mixture of rabbit fur cut from a Zonker Strip combined with short one and one-half inch strands of Peacock Herl Lite-Brite dubbing. I lightly wax the tying thread before I apply the dubbing. After the fly is completed I brush the fly vigorously with a velcro brush to bring the strands of Lite-Brite out. If you don't have a velcro dubbing teaser on your bench and would like to make one, click on Velcro Dubbing Teaser. Mike's Leech also sports a pair of painted lead eyes that are painted with reddish/purple nail polish. He believes that the color of the eyes make a difference. Who am I to doubt. So, I raided my bride's nail polish collection and found the right color. You can probably do the same. I like to attach all of my flies to the leader with a fixed-loop knot to give them as much action in the water as possible. 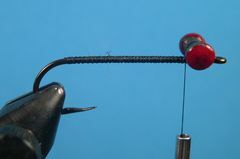 If you would like to learn how to tie fixed-loop knots click on Warmwater Knots. Fish the Lite-Brite Leech with short strips followed by brief pauses. 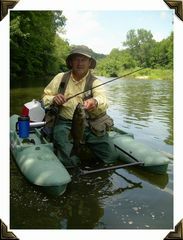 The lead eyes help sink the fly quickly so, depending on where you are fishing it, you may want to start the retrieve shortly after it hits the water. When its fished in rocky structure, especially in streams, the fly frequently hangs up. It generally can be rescued with a sharp roll-cast. Mike also takes a great number of largemouth bass, big bluegills, and catfish with the Leech. I have fished one of his favorite farm ponds with him and that pond has a large population of 20 to 25-inch catfish in it. The Leech and the Bronze Godess do an excellent job taking them. The interesting thing is that the fish are not taken in deep water. Mike fishes both streamers tight against the pond's bank. Often the "cats" will hit almost as soon as the lure touches the water. When you connect with a 20-inch catfish be prepared to spend several minutes landing the fish. They are powerful. Clamp the hook in the vice and crimp the barb. Start the thread at the hook's eye and lay down a base of thread back to the hook's bend. Tie in the lead eyes slightly behind the hook's eye with several figure-eight wraps of thread.You may want to add some super glue to lock the eyes in place. 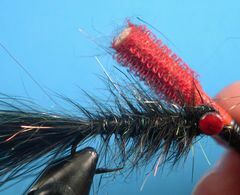 Select a Marabou Plume and bind it to the hook's shank from the base of the eyes to the hook's bend. Doing this provides an underbody. Remove any excess feather. The tail should be approximately as long as the hook. Remove several strands of Lite-Brite Dubbing from the pack and tie them in on both sides of the Marabou tail. Trim the strands so that they are as long as the tail. Lite-Brite Dubbing comes loose in the pack or in hanks. Either will work. 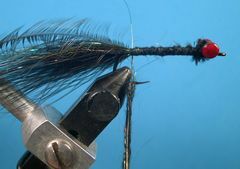 Select an appropriately sized feather from a Whiting Bugger Pack and prepare it to be tied in at the base of the tail. 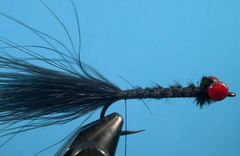 Tie in the feather by the tip at the base of the tail with the concave side of the feather facing the hook. Apply a fairly thick noodle of dubbing to the thread to begin dubbing the body. You may want to wax the thread. Dub a tapered body up to the lead eyes. 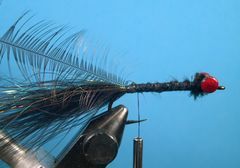 Wrap the bugger feather up the hook's shank to the lead eyes with fairly wide wraps. 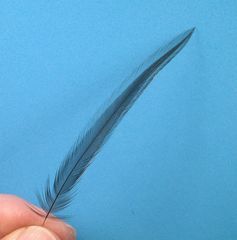 Remove any excess feather. Apply some dubbing to the thread and figure-eight the dubbed thread around the lead eyes to provide a pronounced head. The dubbing should be noticed around the eyes. Move the thread to the front of the eyes, make a neat thread head, and tie off the thread. Add a drop of head cement to the thread wraps. 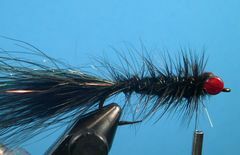 Brush the body of the fly vigorously with a dubbing brush to marry the dubbing, especially the Lite-Brite strands, with the hackle. The Lite-Brite strands should protrude out at varying lengths to catch light when the fly is fished. Your Lite-Brite Leech is finished. Go fish!